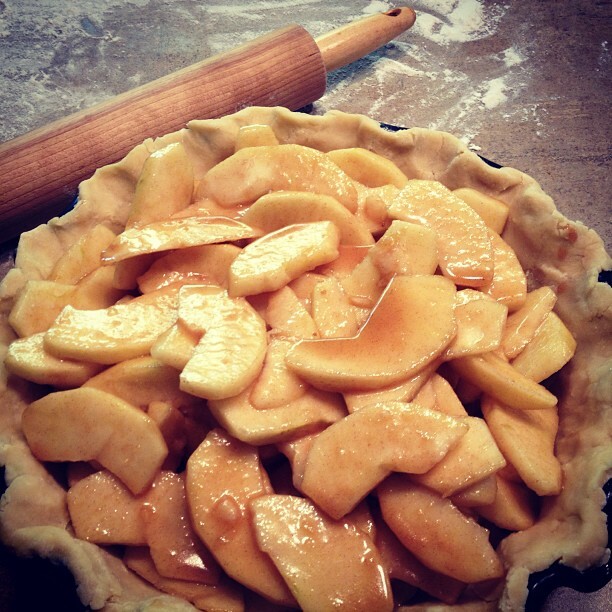 Some days are just meant for baking pies, and today is one of them! If you’re like me, you have a special Pinterest board set aside just for the special dessert ideas that you want to try! Well, I’ve had a pin that I’ve been waiting to try as soon as apple season got here. 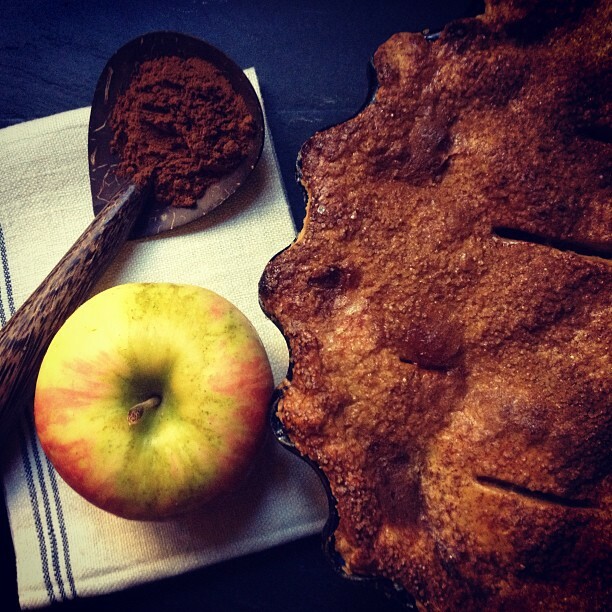 It’s called Cider Caramel Apple Pie. I got my initial inspiration from Hannah’s pin below, and have added my own tweaks to it. We’re going to start making the caramel, and let it simmer while we’re making the crust. You could also make it ahead & use it for other recipes as well. Add sugar & butter, stir occationally & reduce again to approx 1 1/4 Cups – until it thickens slightly. Then turn of the heat. She loves this recipe so much, that she doesn’t ever use any other! I can tell you, it was very easy to make! * For pastry topped pies such as this one, simply double the recipe & keep the top half covered until ready to roll out & finish pie. Mix flour & butter with fork or pastry blender until they resemble fine crumbs. Mix in sugar. Make a well in the center, and add egg yolk & cold water. Mix gently until it’s mostly together. With flour dusted hand, gently work pastry dough togehter. Don’t overmix, because the crust will be tough. Roll out gently on a lightly floured surface. Lift dough with your rolling pin, and place in pie dish removing excess. Place in fridge while making filling. *To make a savory pie, you can simply leave out the sugar. Mix spices, then mix in flour & sugar. Sprinkle over apples in the bowl & mix. Stir in vanilla & caramel, and pour into crust. Roll out crust & top pie, crimping sides. Using a knife, cut 4 steam vents in the top crust. Beat 1 egg and brush on top of crust, then sprinkle sugar & cinnamon. Bake for 45-60 minutes – until brown & juices are bubbly. If the edges of your crust start to brown more than you’d like, simply cover the edges with some tinfoil for the remaining baking time. You must allow pie to cool before cutting, or it will be too runny. 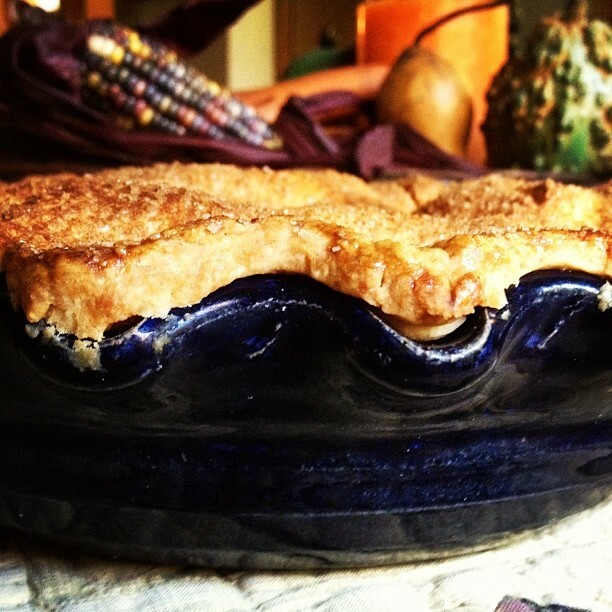 I LOVE this cobalt blue pottery pie dish that my mom bought for me years ago! It was made by a local potter – Mr. White. Enjoy & feel free to Pin & Share! I just love the smell of apple pie baking in the kitchen! But the one thing I like better than smelling it is eating it! The recipe is basically a biscuit recipe (which might be familiar to you, if you already make biscuits in your kitchen), and a group of other ingredients that would be used in making an apple pie. First lets make the biscuit part of the recipe. Add the milk a little at a time while mixing gently. The batter does not have to be smooth, and is ready to work with as soon as it can be picked up & rolled out. Then, on a surface dusted with flour, roll the dough out into a large rectangle (approx. 8X12). Spread 1 tablespoon of the softened butter over the dough. 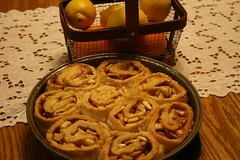 Spread the apples over the dough, leaving about an inch on all sides. Then, mix the brown sugar and cinnamon together and sprinkle over apples. Why don’t you go ahead & turn your oven up to 400 right now, that way it will be heated enough to put the rolls in when you’re ready. Mix the granulated sugar, water, lemon juice, and 2 tablespoons of the butter together in a pot & cook until dissolved. Pour this mixture into a shallow baking dish. Starting with the longest end, carefully start rolling up the pastry. When you’re done, you should have what looks like a 12 inch long tube – not a VERY fat stumpy 8 inch log 🙂 Slice the roll into 1 inch pieces, and place them in the baking dish with the sugar mixture – apple side up. Spread the remaining butter on top of the rolls, and then bake them for 30-35 minutes. These would be great served with some heavy whipping cream or a spoon of vanilla ice cream! Autumn is the most wonderful, and brilliantly colorful time of year. Evenings are spent in front of the fireplace with a cup of cocoa, fuzzy slippers, grandma’s quilt, and fond recollections of the days events. This Autumn, as in previous years, our family spent a day at the apple orchard. Every year memories are made, not only in the picking itself, but in the wonderful dishes enjoyed by all – for months to come. Here are a few apple ideas for you. Slice the apple in thin slices – across the middle (makes a beautiful star pattern). Hang them on a string & drape over mantle, or other area for decoration. 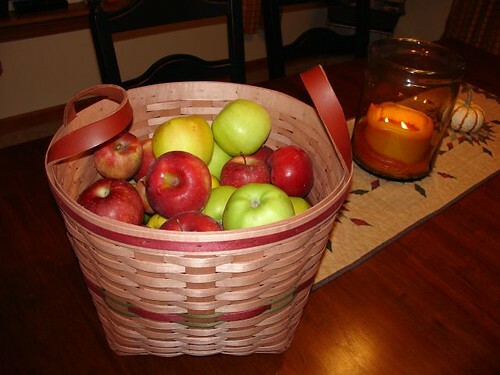 Arrange dried apples around a wreath for a great natural decoration. You can also bag them in zip locks when completely dry & use them as dried apples in recipes. You can freeze the sauce in bags or containers, or can it. Replace the oil & egg in recipes with applesauce – it makes a wonderful moist cake! According to Mott’s applesauce, by replacing 1/3 C oil with 1/3 C of their applesauce, a total of 608 calories & 73 grams of fat will be saved! Make pie pastry, cut into rounds (with drinking glass) fill with 2 spoons of sauce. Fold in half, crimp edges, brush top with butter, sprinkle with sugar. Bake until golden brown. Peel apples and cut into thin wedges. Sprinkle with sugar, and sprinkle a small amount of water around on the top of the apples. This helps the apples make a nice juice during the cooking process. Topping: Mix 1 handful flour, 2 handful brown sugar, 1 1/2 handful oatmeal, good sprinkle of both cinnamon & nutmeg Add 1 stick of very soft butter. Mix until small crumbs form. Add to top of apples & Cook at 350% until bubbly. *Make large batch of this topping & freeze for later use. Use it to top – applesauce, ice cream, hot cereal, pudding etc.